Showing results for tags 'heat stress'. Hey friends! I've been having trouble with my op these past few days. I've been seeing signs of minor heat stress on my plants, the climate will only get hotter into the season and I'd like to ask for some advice on the best way to move forward. 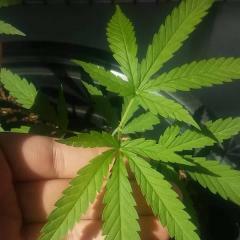 I grew the same sativa variety last year and did well through the season by just managing the placement of my pots within my growspace that provides both direct and ambient sunlight. I currently don't have as much time as I did last year and also my plant count higher now so I've decided to find a more non laborous and efficient alternative to practice. I'm currently thinking of utilizing those clear plastic greenhouse covers because it's within my budget and it's something fairly easy for me to purchase online. What do you guys think? Also one more thing, I decided to post in this section in case there's a soil growing system or set up specifically for hot climates that could I adapt to. Notes: Plant count 15, 52 days in veg, planted individually into 3 gallon plastic pots, plants are spaced well with good constant air flow, all plants recieve 7 to 8 hours of direct sunlight. Daily average temp 89 to 91f in the day 75 to 79 at night. Breeze is very dry at daytime. That's about it. Any advice would be welcomed and appreciated. Thanks!